And straightway Jesus constrained his disciples to get into a ship, and to go before him unto the other side, while he sent the multitudes away. And when he had sent the multitudes away, he went up into a mountain apart to pray: and when the evening was come, he was there alone. But the ship was now in the midst of the sea, tossed with waves: for the wind was contrary. And in the fourth watch of the night Jesus went unto them, walking on the sea. And when the disciples saw him walking on the sea, they were troubled, saying, It is a spirit; and they cried out for fear. But straightway Jesus spake unto them, saying, Be of good cheer; it is I; be not afraid. And Peter answered him and said, Lord, if it be thou, bid me come unto thee on the water. And he said, Come. And when Peter was come down out of the ship, he walked on the water, to go to Jesus. But when he saw the wind boisterous, he was afraid; and beginning to sink, he cried, saying, Lord, save me. And immediately Jesus stretched forth his hand, and caught him, and said unto him, O thou of little faith, wherefore didst thou doubt? And when they were come into the ship, the wind ceased. Then they that were in the ship came and worshipped him, saying, Of a truth thou art the Son of God. Jesus walked on the water to prove to His disciples that He was the Son of God. What is left as an open question is how He preformed this spectacular feat. Some skeptics contend that Jesus used a natural means of support, such as a sand bar or reef. Someone else suggested that Jesus performed the act by walking on surface ice that may have been formed by a freak cold spell. Peter’s involvement in the situation offers little room for a natural explanation. Something obviously transpired to allow Jesus to walk on the surface of Lake Galilee. He could have changed the properties of water molecules so that they locked together with a bond that was strong enough to support Him. Or Jesus could have altered the gravitational weight of His physical body, allowing Him to walk with just the water’s surface tension as support. Who knows? The actual explanation may be so complex that it would give the mind of someone like Albert Einstein a headache. God does not have a magic genie who grants His every wish. Every act of God is performed by God Himself. We humans like to use our imagination to abbreviate the laws of physics, but in the end, scientists have to fill in the details for us. We dreamed of powered flight for centuries, and it wasn’t until the Wright brothers came along that we were able to realize this dream. Any person of average intelligence who goes to see a magical act knows that the magician does not use supernatural powers to saw a woman in half or pull a rabbit out of hat. A more appropriate term for “magician” would be “illusionist”–someone who has mastered the art of entertaining audiences by staging tricks or creating illusions of seemingly impossible exploits using natural means. God doesn’t need smoke and mirrors to accomplish His amazing feats. His type of magic is the result of pure skill. Christians like to break the world down into the supernatural and the natural realm. The world of angels, demons, and the heavenly host is separate from the physical world that we see around us. I think it is erroneous thinking to separate the two worlds. There is really only one physical world. When I go to church, there may be angels dancing around the room. Just because I can’t see them with my eyes doesn’t mean they are immaterial. You can’t see infrared light being emitted by objects around us. We know infrared energy is real because we can sense it by other means. The only thing that separates us from spiritual objects and entities is that they exist on a higher dimension. If we could cross over to the spiritual dimension, we might easily understand how Jesus could walk on water and pass through solid walls. We lose sight of the importance of the heavenly realm by casting it as a place of enchantment. Our general view of Heaven is as a place where we sit on clouds and strum harps all day. The Bible says that Heaven is a city of incredible activity. Its splendor surpasses the glitter of Las Vegas, the hustle and bustle of New York City, and the political authority of Washington DC. 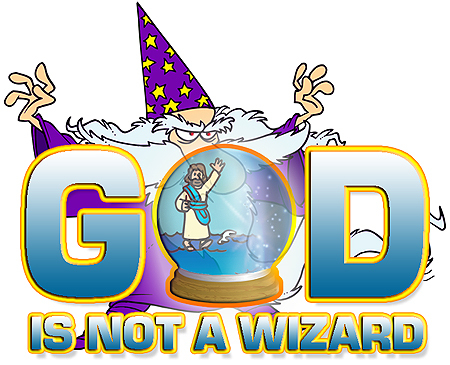 We rob God of His full glory when we imply that He uses magic to accomplish spectacular feats. When God spoke the universe into existence, there was a vast amount of complexity behind His command. We may never see the inner workings of His star-creation process, but for eternity, we can marvel at the end result.